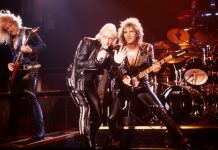 This lessons teaches you how to play Bloodstone written by Judas Priest, the lesson covers all the guitar parts written by Glen Tipton and KK Downing. my third guitar lesson from the album Screaming for Vengeance. It is the eighth studio album by Judas Priest. The album, considered the band’s commercial breakthrough, sold in excess of 5 million units worldwide and has been certified double platinum in the United States of America as well as platinum in Canada. The guitar solo lesson can be found in the premium channel Bloodstone Guitar solo click on the Link and check it out! Screaming for Vengeance was recorded at Ibiza Sound Studios, Ibiza, Spain (during this period, it was commonplace for UK-based musicians to record in continental Europe for tax purposes) mixing and overdubs were done at Beejay Recording Studios and Bayshore Recording Studios in Coconut Grove, Florida. Stylistically, Screaming for Vengeance showcased a harder, heavier sound than British Steel and saw the band quickly reverse direction back into straight heavy rock after the melodically styled direction of Point of Entry. The album also marks the first time a Priest drummer played on more than 2 Judas Priest albums, with Dave Holland having also played on British Steel and Point of Entry. The World Vengeance Tour began shortly after the album’s release in July 1982 and focused on North America during the summer and fall, Priest not performing in Europe until December 1983. This emphasis on US audiences was in order to establish a solid commercial foothold there, and in particular because “You’ve Got Another Thing Comin'” became a major hit. That and “Electric Eye” became live setlist staples and some of the band’s most performed songs. “Devil’s Child” has also been performed on various tours between 1982 and 2008. For comparison, “Fever” was only played at the first two 1982 shows. The 30th-anniversary release of the album in 2012 came with a DVD of a live show recorded in May 1983 at the US Festival in California on the last date of the Screaming For Vengeance Tour. 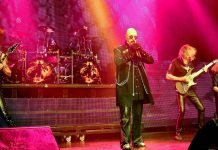 During the US tour to support the album in 1982, Judas Priest were supported by bands such as Iron Maiden, Krokus, and Uriah Heep.